Tax Freedom Day® will fall on April 23 in 2008, according to the Tax Foundation’s annual calculation using the latest government data on income and taxes. (Click here to read the full study). That’s three days earlier than in 2007. 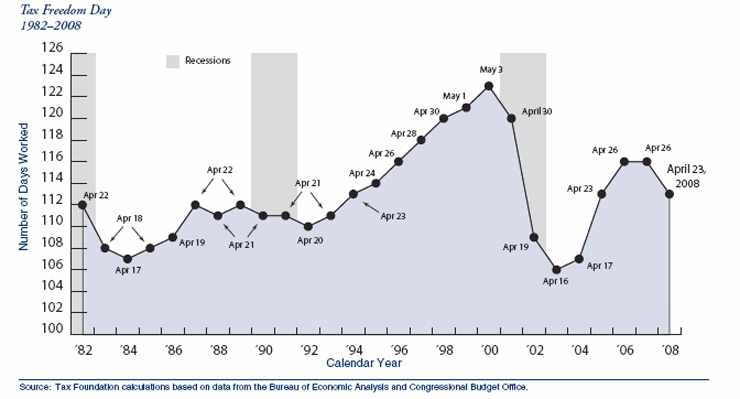 Stimulus rebates and a projection of slow growth in 2008 are the principal reasons for the earlier celebration. The study is Tax Foundation Special Report No. 160, “America Celebrates Tax Freedom Day®,” by Tax Foundation senior economist Gerald Prante and Tax Foundation president Scott Hodge. In addition to announcing the nation’s Tax Freedom Day®, the new study compares tax payments to other major consumer expenditures, traces the course of America’s tax burden since 1900, examines the composition of today’s tax burden by type of tax, and finally calculates a Tax Freedom Day® for each state. In 2008, Americans will work 74 days to afford their federal taxes and 39 more days to pay state and local taxes. Meanwhile, buying food requires 35 days of work, clothing 13 days, and housing 60 days. Other major categories are health and medical care (50 days), transportation (29 days), and recreation (21 days). Five major categories of tax dominate the tax burden. 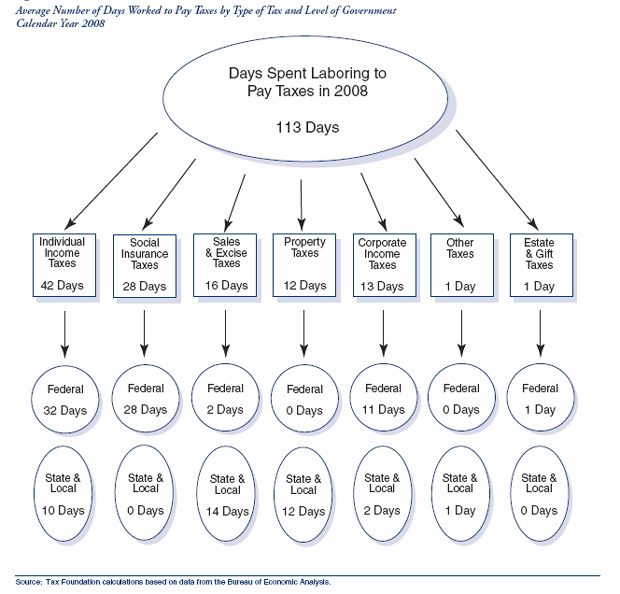 Individual income taxes, both federal and state, require 42 days’ work. Payroll taxes take another 28 days’ work. 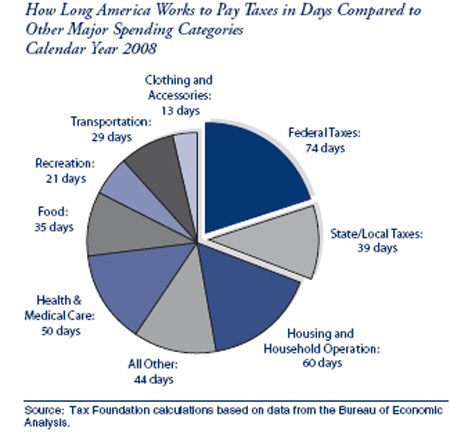 Sales and excise taxes, mostly state and local, take 16 days to pay off. Corporate income taxes take 13 days, and property taxes take 12. Alaskans kick off the celebration of Tax Freedom Day® on March 29, more than a week before any other state’s taxpayers. Mississippi (April 7), Montana and West Virginia (April 8), and Alabama (April 9) round out the first five. The next five are Kentucky (April 10), Tennessee and Oklahoma (April 11), and New Mexico and South Dakota (April 12). Tax Freedom Day® is early in low-income states because the federal income tax hits most of their federal income taxes at the lower rates, 10% and 15%. Alaska stands out as an exception: income and federal tax payments are above average there, but state-local taxes are extraordinarily low. Three states will have to wait until May to celebrate their state-specific Tax Freedom Days: Connecticut, New Jersey and New York. Although they have high state-local taxes too, the main culprit is the progressive federal income tax. States with large metropolitan areas offer higher-paying jobs, and as a result, many of the citizens earn enough to pay income tax at the highest rates — currently 25%, 28%, 33% and 35%. 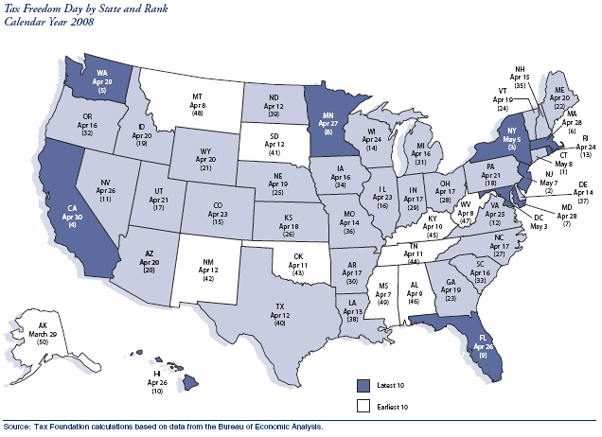 If those rates rise, as they are scheduled to do in 2011, these states will bear the brunt. Tax Freedom Day® answers the basic question, “What price is the nation paying for government?” An official government figure for total tax collections is divided by the nation’s total income. The answer this year is that taxes will amount to 30.8 percent of our income, and the stretch of 113 days from January 1 to April 23 is 30.8 percent of the year. Income and tax data are then parsed out to the states, yielding 50 state-specific Tax Freedom Days. Source: Office of Management and Budget; Internal Revenue Service; Congressional Research Service; National Bureau of Economic Research; Tax Foundation. Click here to view every state’s Tax Freedom Day and rank from 1970 to 2007.